veriqster Wrote: ------------------------------------------------------- > HA, HA, the 64 bit version of Putty for Windows > works a little better, it copies output. > > Just remounted the usb drive in Ubuntu and did a > sync followed by a umount and that tried booting > the pogo again, this time with the Windows Putty > connected. It will not log anything for some > reason but allows me to copy the text in the > console. > Following is the output from the console. > I also created a uEnv file, I can copy the content > on the file and post it if needed, it's a > copy-paste from one of your posts on installing > Debian. > > Any ideas? > > Error writing session log (ASCII mode) to file: > putty.log > > [code] > U-Boot SPL 2013.10-tld-4 (Sep 07 2014 - 14:10:12) > Boot device: NAND > Attempting to set PLLA to 850 MHz ... > plla_ctrl0 : 0000020a > plla_ctrl1 : 00330000 > plla_ctrl2 : 0065008b > plla_ctrl3 : 000000f1 > > PLLA Set > > > U-Boot 2015.10-tld-2 (Oct 21 2017 - 22:00:02 > -0700) > OXNAS OX820 > > DRAM: 128 MiB > NAND: 128 MiB > In: serial > Out: serial > Err: serial > Net: dwmac.40400000 > Hit any key to stop autoboot: 0 > starting USB... > USB0: USB EHCI 1.00 > scanning bus 0 for devices... 3 USB Device(s) > found > scanning usb for storage devices... 1 > Storage Device(s) found > > Reset IDE: SATA PHY not ready for device 0 > ide_preinit failed > > Partition Map for USB device 0 -- Partition > Type: EFI > > Part Start LBA End LBA Name > Attributes > Type GUID > Partition GUID > 1 0x00000800 0x0efd37ff "ROOTFS" > attrs: 0x0000000000000000 > type: > 0fc63daf-8483-4772-8e79-3d69d8477de4 > guid: > f75f25cd-6736-445a-aaad-21039b0fcaa2 > loading envs from usb 0 ... > 1350 bytes read in 280 ms (3.9 KiB/s) > > no IDE devices available > importing envs ... > running scan_disk ... > Scan device usb > device usb 0:1 > 1 bytes read in 264 ms (0 Bytes/s) > Found bootable drive on usb 0 > loading uImage ... > 4102704 bytes read in 426 ms (9.2 MiB/s) > loading uInitrd ... > 1953812 bytes read in 328 ms (5.7 MiB/s) > loading DTB /boot/dts/ox820-pogoplug-pro.dtb ... > 7029 bytes read in 301 ms (22.5 KiB/s) > ## Booting kernel from Legacy Image at 60500000 > ... > Image Name: Linux-3.17.0-oxnas-tld-1 > Created: 2014-11-01 7:16:44 UTC > Image Type: ARM Linux Kernel Image > (uncompressed) > Data Size: 4102640 Bytes = 3.9 MiB > Load Address: 60008000 > Entry Point: 60008000 > Verifying Checksum ... OK > ## Loading init Ramdisk from Legacy Image at > 60e00000 ... > Image Name: initramfs-3.17.0-oxnas-tld-1 > Created: 2014-11-01 7:18:53 UTC > Image Type: ARM Linux RAMDisk Image (gzip > compressed) > Data Size: 1953748 Bytes = 1.9 MiB > Load Address: 60000000 > Entry Point: 60000000 > Verifying Checksum ... OK > ## Flattened Device Tree blob at 62c00000 > Booting using the fdt blob at 0x62c00000 > Loading Kernel Image ... OK > Loading Ramdisk to 67c49000, end 67e25fd4 ... > OK > Loading Device Tree to 67c44000, end 67c48b74 > ... OK > > Starting kernel ... > > Uncompressing Linux... done, booting the kernel. > [ 0.000000] Booting Linux on physical CPU 0x0 > [ 0.000000] Linux version 3.17.0-oxnas-tld-1 > (root@tldDebian) (gcc version 4. > > 6.3 (Debian 4.6.3-14) ) #1 SMP > PREEMPT Sat Oct 25 15:59:43 PDT 2014 > [ 0.000000] CPU: ARMv6-compatible processor > [410fb025] revision 5 (ARMv7), cr > > =00c5787d > [ 0.000000] CPU: PIPT / VIPT nonaliasing data > cache, VIPT aliasing instructio > > n cache > [ 0.000000] Machine model: Pogoplug Pro > [ 0.000000] Memory policy: Data cache > writealloc > [ 0.000000] DT missing boot CPU MPIDR[23:0], > fall back to default cpu_logical > > _map > [ 0.000000] Start Ox820 platform > [ 0.000000] PERCPU: Embedded 7 pages/cpu > @c7ee3000 s6592 r8192 d13888 u32768 > [ 0.000000] Built 1 zonelists in Zone order, > mobility grouping on. 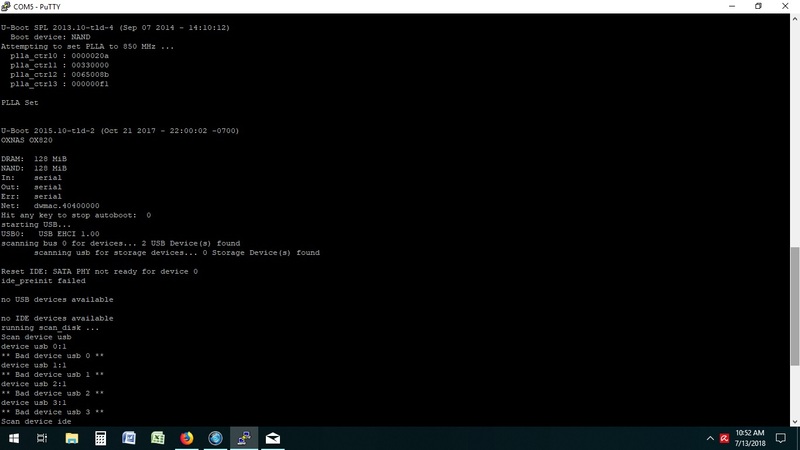 Total pag > > es: 32512 > [ 0.000000] Kernel command line: > console=ttyS0,115200 root=LABEL=rootfs rootd > > elay=10 > mtdparts=41000000.nand:14m(boot),-(data) > [ 0.000000] PID hash table entries: 512 (order: > -1, 2048 bytes) > [ 0.000000] Dentry cache hash table entries: > 16384 (order: 4, 65536 bytes) > [ 0.000000] Inode-cache hash table entries: > 8192 (order: 3, 32768 bytes) > [ 0.000000] Memory: 119844K/131072K available > (5686K kernel code, 286K rwdata > > , 1680K rodata, 174K init, 233K > bss, 11228K reserved) > [ 0.000000] Virtual kernel memory layout: > [ 0.000000] vector : 0xffff0000 - > 0xffff1000 ( 4 kB) > [ 0.000000] fixmap : 0xffc00000 - > 0xffe00000 (2048 kB) > [ 0.000000] vmalloc : 0xc8800000 - > 0xff000000 ( 872 MB) > [ 0.000000] lowmem : 0xc0000000 - > 0xc8000000 ( 128 MB) > [ 0.000000] modules : 0xbf000000 - > 0xc0000000 ( 16 MB) > [ 0.000000] .text : 0xc0008000 - > 0xc0739db0 (7368 kB) > [ 0.000000] .init : 0xc073a000 - > 0xc07659c0 ( 175 kB) > [ 0.000000] .data : 0xc0766000 - > 0xc07adb00 ( 287 kB) > [ 0.000000] .bss : 0xc07adb00 - > 0xc07e809c ( 234 kB) > [ 0.000000] SLUB: HWalign=32, Order=0-3, > MinObjects=0, CPUs=2, Nodes=1 > [ 0.000000] Preemptible hierarchical RCU > implementation. > [ 0.000000] NR_IRQS:160 > [ 0.000015] sched_clock: 24 bits at 390kHz, > resolution 2560ns, wraps every 42 > > 949670400ns > [ 0.000181] Console: colour dummy device 80x30 > [ 0.000209] Calibrating delay loop... 339.14 > BogoMIPS (lpj=1695744) > [ 0.050048] pid_max: default: 32768 minimum: > 301 > [ 0.050219] Mount-cache hash table entries: > 1024 (order: 0, 4096 bytes) > [ 0.050234] Mountpoint-cache hash table > entries: 1024 (order: 0, 4096 bytes) > [ 0.051061] Initializing cgroup subsys net_cls > [ 0.051123] CPU: Testing write buffer > coherency: ok > [ 0.051509] Setting up static identity map for > 0x60567fa0 - 0x60567fd8 > [ 0.110448] CPU1: Booted secondary processor > [ 0.170140] Brought up 2 CPUs > [ 0.170165] SMP: Total of 2 processors > activated. > [ 0.171100] devtmpfs: initialized > [ 0.175093] prandom: seed boundary self test > passed > [ 0.179013] prandom: 100 self tests passed > [ 0.179036] pinctrl core: initialized pinctrl > subsystem > [ 0.181877] NET: Registered protocol family 16 > [ 0.182415] DMA: preallocated 256 KiB pool for > atomic coherent allocations > [ 0.186675] gpio-oxnas 44000000.gpio: at > address c8846000 > [ 0.186967] gpio-oxnas 44100000.gpio: at > address c8848000 > [ 0.187520] pinctrl-oxnas pinctrl: initialized > OX820 pinctrl driver > [ 0.309314] oxnas-pcie 47c0: PCIe > version/deviceID 0x82510b5 > [ 0.309432] oxnas-pcie 47c0: link up > [ 0.309657] oxnas-pcie 47c0: PCI host bridge to > bus 0000:00 > [ 0.309683] pci_bus 0000:00: root bus resource > [mem 0x48000000-0x49ffffff] > [ 0.309701] pci_bus 0000:00: root bus resource > [mem 0x4a000000-0x4bdfffff pre > > f] > [ 0.309719] pci_bus 0000:00: root bus resource > [io 0x4be00000-0x4befffff] > [ 0.309736] pci_bus 0000:00: root bus resource > [bus 00-7f] > [ 0.310208] PCI: bus0: Fast back to back > transfers disabled > [ 0.310284] pci 0000:00:00.0: BAR 0: assigned > [mem 0x48000000-0x4800ffff] > [ 0.310668] vgaarb: loaded > [ 0.311162] SCSI subsystem initialized > [ 0.312040] usbcore: registered new interface > driver usbfs > [ 0.312148] usbcore: registered new interface > driver hub > [ 0.312350] usbcore: registered new device > driver usb > [ 0.312465] pps_core: LinuxPPS API ver. 1 > registered > [ 0.312481] pps_core: Software ver. 5.3.6 - > Copyright 2005-2007 Rodolfo Giome > > tti <giometti@linux.it> > [ 0.312547] PTP clock support registered > [ 0.314109] cfg80211: Calling CRDA to update > world regulatory domain > [ 0.314590] Switched to clocksource > rps_clocksource_timer > [ 0.328389] NET: Registered protocol family 2 > [ 0.329507] TCP established hash table entries: > 1024 (order: 0, 4096 bytes) > [ 0.329553] TCP bind hash table entries: 1024 > (order: 1, 8192 bytes) > [ 0.329589] TCP: Hash tables configured > (established 1024 bind 1024) > [ 0.329679] TCP: reno registered > [ 0.329710] UDP hash table entries: 256 (order: > 1, 8192 bytes) > [ 0.329753] UDP-Lite hash table entries: 256 > (order: 1, 8192 bytes) > [ 0.330099] NET: Registered protocol family 1 > [ 0.330588] RPC: Registered named UNIX socket > transport module. > [ 0.330608] RPC: Registered udp transport > module. > [ 0.330621] RPC: Registered tcp transport > module. > [ 0.330634] RPC: Registered tcp NFSv4.1 > backchannel transport module. > [ 0.331025] Unpacking initramfs... > [ 0.530565] Freeing initrd memory: 1904K > (c7c49000 - c7e25000) > [ 0.531676] futex hash table entries: 512 > (order: 2, 16384 bytes) > [ 0.550438] NFS: Registering the id_resolver > key type > [ 0.550515] Key type id_resolver registered > [ 0.550530] Key type id_legacy registered > [ 0.550566] nfs4filelayout_init: NFSv4 File > Layout Driver Registering... > [ 0.550586] Installing knfsd (copyright (C) > 1996 okir@monad.swb.de). > [ 0.551429] fuse init (API version 7.23) > [ 0.552814] msgmni has been set to 237 > [ 0.553338] Key type big_key registered > [ 0.557166] alg: No test for stdrng (krng) > [ 0.623979] Block layer SCSI generic (bsg) > driver version 0.4 loaded (major 2 > > 52) > [ 0.624012] io scheduler noop registered > [ 0.624035] io scheduler deadline registered > [ 0.624386] io scheduler cfq registered > (default) > [ 0.624929] Serial: 8250/16550 driver, 1 ports, > IRQ sharing disabled > [ 0.626214] console [ttyS0] disabled > [ 0.626462] 44200000.uart: ttyS0 at MMIO > 0x44200000 (irq = 55, base_baud = 39 > > 0625) is a 16550A > [ 1.181281] console [ttyS0] enabled > [ 1.186480] scsi host0: sata_oxnas > [ 1.190481] ata1: SATA max UDMA/133 irq 50 > [ 1.194846] ox820sata: reseting SATA core > [ 1.195978] nand: Could not find valid ONFI > parameter page; aborting > [ 1.196021] nand: device found, Manufacturer > ID: 0xad, Chip ID: 0xf1 > [ 1.196026] nand: Hynix NAND 128MiB 3,3V 8-bit > [ 1.196034] nand: 128MiB, SLC, page size: 2048, > OOB size: 64 > [ 1.196049] Scanning device for bad blocks > [ 1.277772] 2 cmdlinepart partitions found on > MTD device 41000000.nand > [ 1.284285] Creating 2 MTD partitions on > "41000000.nand": > [ 1.289661] 0x000000000000-0x000000e00000 : > "boot" > [ 1.295920] 0x000000e00000-0x000008000000 : > "data" > [ 1.302656] stmmaceth 40400000.ethernet: no > reset control found > [ 1.308556] stmmac - user ID: 0x12, Synopsys > ID: 0x35 > [ 1.313620] Ring mode enabled > [ 1.316659] DMA HW capability register > supported > [ 1.321177] Enhanced/Alternate descriptors > [ 1.325506] Enabled extended descriptors > [ 1.329489] RX Checksum Offload Engine > supported (type 2) > [ 1.334955] TX Checksum insertion supported > [ 1.339200] Wake-Up On Lan supported > [ 1.342853] Enable RX Mitigation via HW > Watchdog Timer > [ 1.369121] libphy: stmmac: probed > [ 1.372556] eth0: PHY ID 001cc914 at 0 IRQ POLL > (stmmac-0:00) active > [ 1.378880] eth0: PHY ID 001cc914 at 3 IRQ POLL > (stmmac-0:03) > [ 1.384755] PPP generic driver version 2.4.2 > [ 1.389358] rt2800pci 0000:00:00.0: enabling > device (0140 -> 0142) > [ 1.395747] ieee80211 phy0: rt2x00_set_rt: Info > - RT chipset 3090, rev 3213 d > > etected > [ 1.406929] ieee80211 phy0: rt2x00_set_rf: Info > - RF chipset 0005 detected > [ 1.415895] ehci_hcd: USB 2.0 'Enhanced' Host > Controller (EHCI) Driver > [ 1.422451] ehci-pci: EHCI PCI platform driver > [ 1.427238] oxnas-ehci 40200100.ehci: EHCI Host > Controller > [ 1.432778] oxnas-ehci 40200100.ehci: new USB > bus registered, assigned bus nu > > mber 1 > [ 1.440588] oxnas-ehci 40200100.ehci: irq 39, > io mem 0x40200100 > [ 1.460544] oxnas-ehci 40200100.ehci: USB 2.0 > started, EHCI 1.00 > [ 1.466816] usb usb1: New USB device found, > idVendor=1d6b, idProduct=0002 > [ 1.473605] usb usb1: New USB device strings: > Mfr=3, Product=2, SerialNumber= > > 1 > [ 1.480806] usb usb1: Product: EHCI Host > Controller > [ 1.485662] usb usb1: Manufacturer: Linux > 3.17.0-oxnas-tld-1 ehci_hcd > [ 1.492085] usb usb1: SerialNumber: > 40200100.ehci > [ 1.497630] hub 1-0:1.0: USB hub found > [ 1.501475] hub 1-0:1.0: 2 ports detected > [ 1.506094] usbcore: registered new interface > driver cdc_acm > [ 1.511761] cdc_acm: USB Abstract Control Model > driver for USB modems and ISD > > N adapters > [ 1.519841] usbcore: registered new interface > driver cdc_wdm > [ 1.525708] usbcore: registered new interface > driver usb-storage > [ 1.531957] usbcore: registered new interface > driver usbserial > [ 1.537827] usbcore: registered new interface > driver usbserial_generic > [ 1.544435] usbserial: USB Serial support > registered for generic > [ 1.550743] mousedev: PS/2 mouse device common > for all mice > [ 1.556303] i2c /dev entries driver > [ 1.560919] usbcore: registered new interface > driver usbhid > [ 1.566466] usbhid: USB HID core driver > [ 1.570647] TCP: cubic registered > [ 1.575063] NET: Registered protocol family 10 > [ 1.580032] ata1: SATA link down (SStatus 0 > SControl 310) > [ 1.586344] sit: IPv6 over IPv4 tunneling > driver > [ 1.591969] NET: Registered protocol family 17 > [ 1.596561] Key type dns_resolver registered > [ 1.605271] Freeing unused kernel memory: 172K > (c073a000 - c0765000) > Loading, please wait... > [ 1.731566] udevd: starting version 175 > [ 1.820700] usb 1-1: new high-speed USB device > number 2 using oxnas-ehci > [ 1.982092] usb 1-1: New USB device found, > idVendor=05e3, idProduct=0608 > [ 2.000243] usb 1-1: New USB device strings: > Mfr=0, Product=1, SerialNumber=0 > [ 2.017797] usb 1-1: Product: USB2.0 Hub > [ 2.025441] hub 1-1:1.0: USB hub found > [ 2.036346] hub 1-1:1.0: 4 ports detected > [ 2.340897] usb 1-1.1: new high-speed USB > device number 3 using oxnas-ehci > [ 2.452769] usb 1-1.1: New USB device found, > idVendor=154b, idProduct=005b > [ 2.459617] usb 1-1.1: New USB device strings: > Mfr=1, Product=2, SerialNumber > > =3 > [ 2.466915] usb 1-1.1: Product: USB 2.0 FD > [ 2.471011] usb 1-1.1: Manufacturer: PNY > Technologies > [ 2.476039] usb 1-1.1: SerialNumber: > AF609H07YD26001952 > [ 2.483223] usb-storage 1-1.1:1.0: USB Mass > Storage device detected > [ 2.489991] scsi host1: usb-storage 1-1.1:1.0 > [ 2.509719] usbcore: registered new interface > driver uas > [ 4.091765] scsi 1:0:0:0: Direct-Access PNY > USB 2.0 FD 1100 PQ > > : 0 ANSI: 4 > [ 4.104791] sd 1:0:0:0: [sda] 251477760 > 512-byte logical blocks: (128 GB/119 > > GiB) > [ 4.113118] sd 1:0:0:0: [sda] Write Protect is > off > [ 4.119498] sd 1:0:0:0: [sda] No Caching mode > page found > [ 4.124933] sd 1:0:0:0: [sda] Assuming drive > cache: write through > [ 4.145482] sda: sda1 > [ 4.153858] sd 1:0:0:0: [sda] Attached SCSI > removable disk > Begin: Loading essential drivers ... done. > Begin: Running /scripts/init-premount ... done. > Begin: Mounting root file system ... Begin: > Running /scripts/local-top ... done. > Begin: Waiting for root file system ... done. > Gave up waiting for root device. Common > problems: > - Boot args (cat /proc/cmdline) > - Check rootdelay= (did the system wait long > enough?) > - Check root= (did the system wait for the > right device?) > - Missing modules (cat /proc/modules; ls /dev) > ALERT! /dev/disk/by-label/rootfs does not exist. > Dropping to a shell! > modprobe: module i8042 not found in modules.dep > modprobe: module atkbd not found in modules.dep > modprobe: module uhci-hcd not found in > modules.dep > modprobe: module ohci-hcd not found in > modules.dep > > > BusyBox v1.20.2 (Debian 1:1.20.0-7) built-in shell > (ash) > Enter 'help' for a list of built-in commands. > > /bin/sh: can't access tty; job control turned off > (initramfs) > [/code] > > ---- > Mod edit: please post log in code tags (use the > Formtted Code button on the far right, above your > post edit box).